Yes. 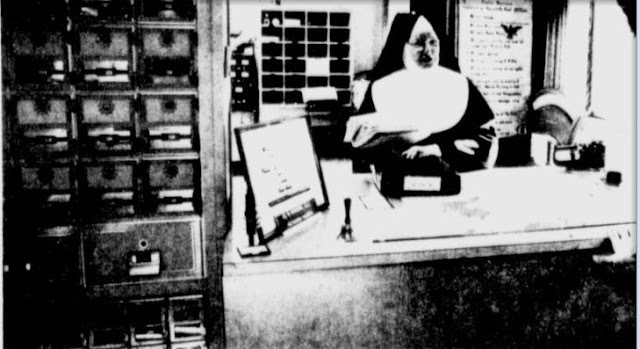 That is, in fact, a nun on the postal side of the counter in a post office. She is Sister Marciana, SSJ, and she was the postmaster of the Nazareth, Michigan Post Office. This picture appeared in newspapers around the country in 1974. 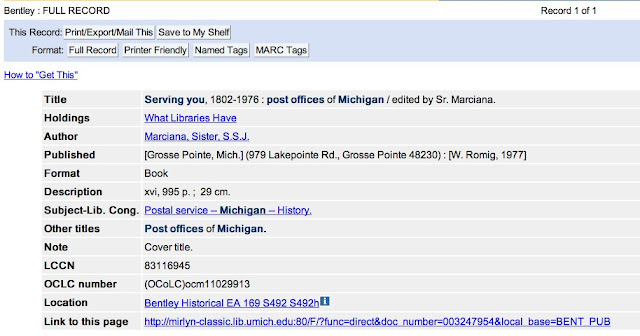 But this blog post is not specifically about Sister Marciana; it is about the book she edited: Serving You 1802-1976: Post Offices of Michigan. Researching this book and its catalog records has become an adventure. I have no formal library cataloging training; but I have cataloged just enough books on Library Thing, and researched just enough cataloging references online from AACR2 (Anglo American Cataloging Rules) and RDA (Resource Description and Access) to make me dangerous. I invite professional library catalogers to contact me and correct me when I "put book in mouth" while discussing library cataloging. 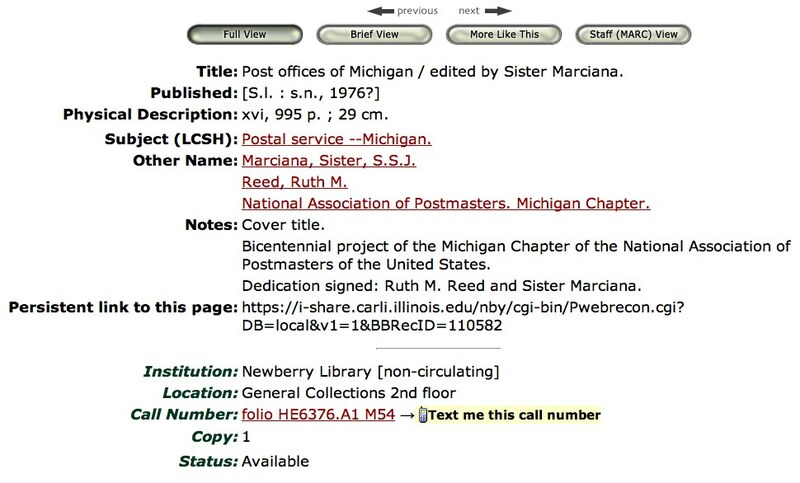 In July 1975, the President of the National Association of Postmasters, Michigan Chapter, appointed Sister Marciana, SSJ, Postmaster, Nazareth, Michigan to gather and edit a history of all of the post offices of the state of Michigan "serving the people of the world in 1976." The book was to be the contribution of the Postmasters of Michigan for the Bicentennial Year. Together with Ruth M. Reed, Postmaster of Cloverdale, Michigan, Sister Marciana traveled to the General Services Administration in Washington, D.C., combed the micro-films of the General Archives—now called the National Archives—and gathered the names of Michigan Postmasters from the early 1800s on. When she finally finished gathering, compiling, and editing the mounds of postal information, her book contained 995 pages. But one page Sister Marciana did not add was a Title Page! The title, name of the author, and date of publication are different in these two catalog records. And the information recorded for name of publisher and place of publication is different. Both the LOC catalog record and the Smithsonian Libraries catalog record are not completely accurate. 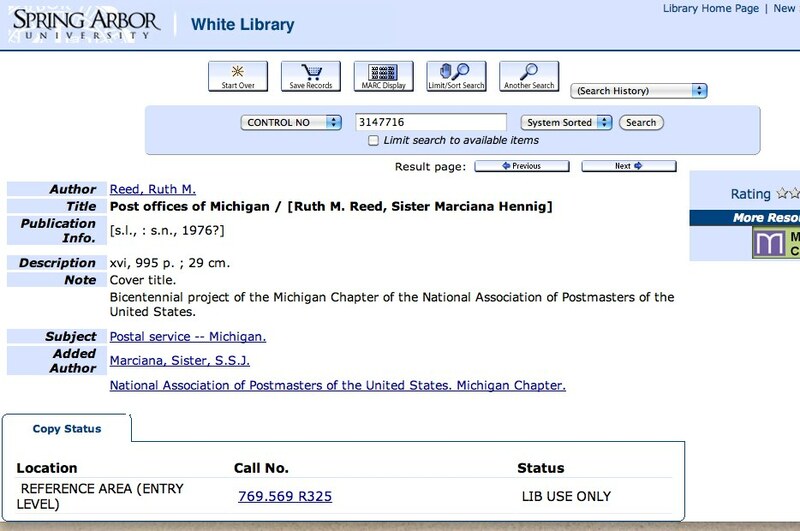 The name of the publisher and the place of publication in the LOC catalog record are not accurate. The book was self-published; Walter Romig (1903-1977) was not the publisher. 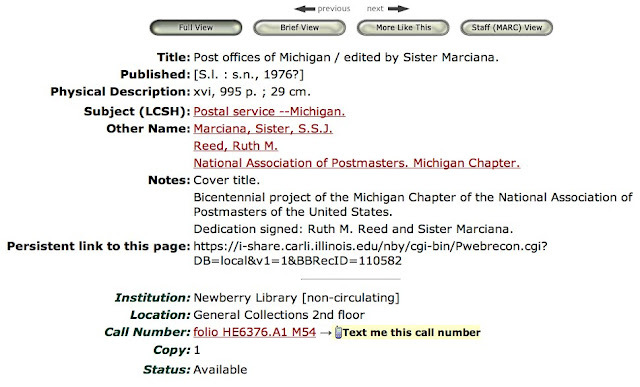 A closer look at the Editor's Acknowledgments Page reveals that Sister Marciana was merely acknowledging that she used Walter Romig's book, Michigan Place Names, to help identify the post offices of Michigan. She inserted Walter Romig's offical title of publisher and his address after his name purely as a means of formal identification. She did the same for the others listed on the Editor's Acknowledgements Page. As for Walter Romig, he was an author himself and a publisher of numerous books, all of which have title pages. If Walter Romig were the publisher of Sister Marciana's book, don't you think he would have included a title page? 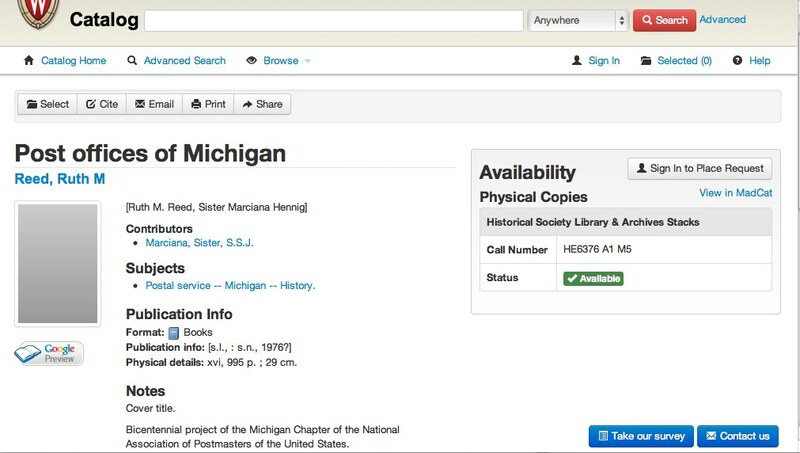 The name of the author, and probable date of publication in the Smithsonian Libraries catalog record are not accurate. The cataloger should have obtained the name of the author from the cover as well, instead of from the Dedication Page. The cover clearly states, "edited by Sr. Marciana, SSJ." 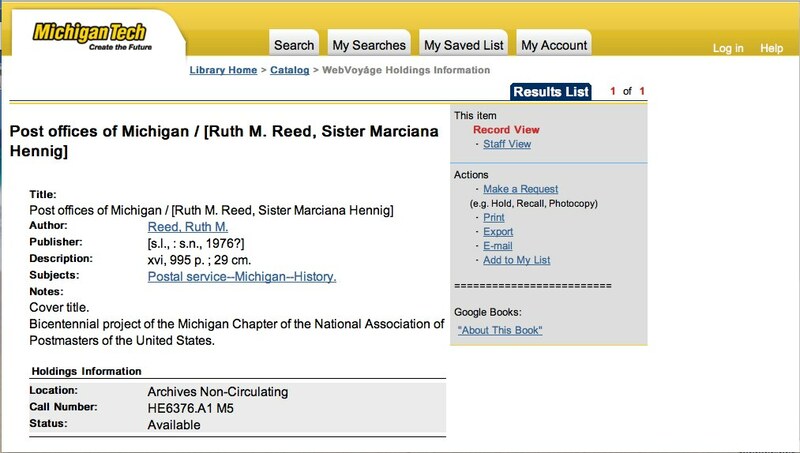 Ruth M. Reed's name is not listed on the cover. 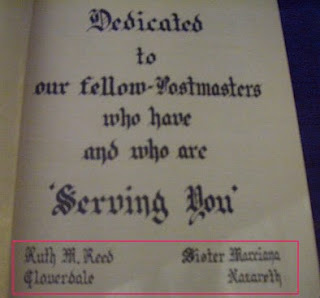 Nor is Ruth M. Reed one of the signatories of either the Editor's Note Page or the Editor's Acknowledgments Page. The former page begins with the words, "Little did I dream," and the latter page begins with the words, "Were I to name all." If Ruth M. Reed were one of the editors, the word "we" would have replaced the word "I." Ruth M. Reed's only stated contribution to the book was helping Sister Marciana research the names of former postmasters in the National Archives, a contribution which Sister Marciana mentions in the Editor's Note Page. The date of publication is incorrectly listed as 1976. I queried the Smithsonian Libaries, asking if its copy included the dust jacket. Baasil Wilder, Reference Librarian, History and Culture Department, Research Services Division, Smithsonian Libraries, verified that the Smithsonian Libraries copy, which the library received in 1980, lacks the dust jacket. 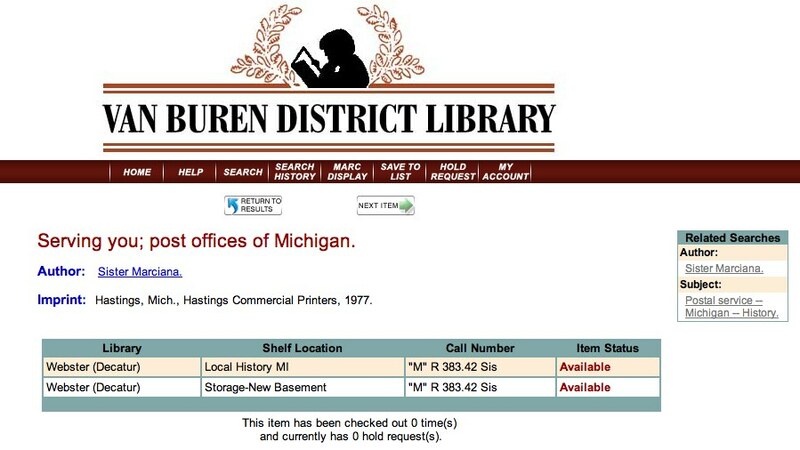 The lack of the dust jacket deprived the cataloger of the source for the printing statement: "LIMITED EDITION, June 1977 Hastings Commercial Printers Barry County Hastings Michigan." Since the book was "a bicentennial project," the cataloger probably figured the book was published in 1976. A little later, I will show that dated entries in the book make it unlikely that the book was published in 1976. "Post Offices Serving All the People of Michigan." Chime in librarians, please! Should Sister Marcians's own title be the title that is recorded in the catalog record of her book? 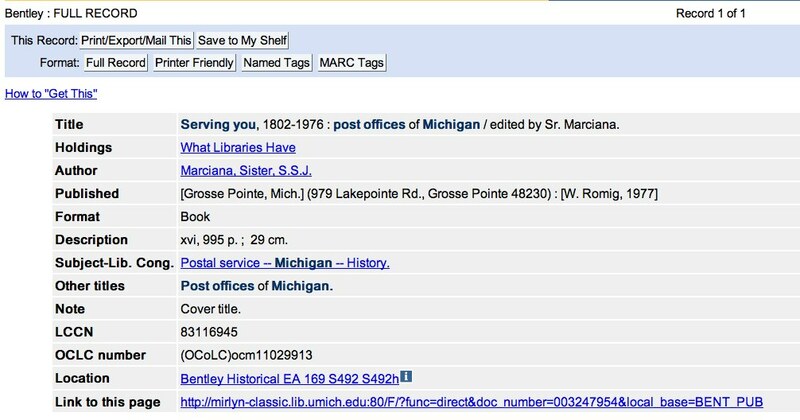 There are at least thirteen other libraries who have copies of Sister Marciana's book, all but one of which I identified via WorldCat. 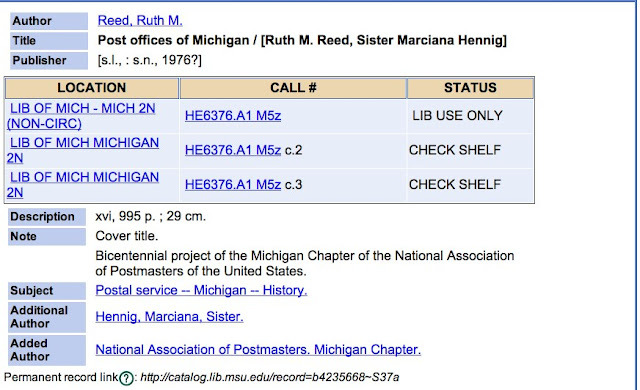 The catalog records of seven libraries are practically mirror images of the Smithsonian Libraries catalog record. I queried the Eastern Michigan University Library, asking if its copy had the dust jacket. Keith Stanger, Information Services Librarian, responded that the EMU copy was lacking its dust jacket. For want of a title page, the publication statement was not found. For want of the publication statement, the name of the publisher, and place and date of publication were not found. For want of the name of the publisher, and place and date of publication, an accurate catalog record was not found. And all for the want of a title page. I find this catalog record to be significant because it includes the dust jacket's printing statement as a core element in the catalog record. 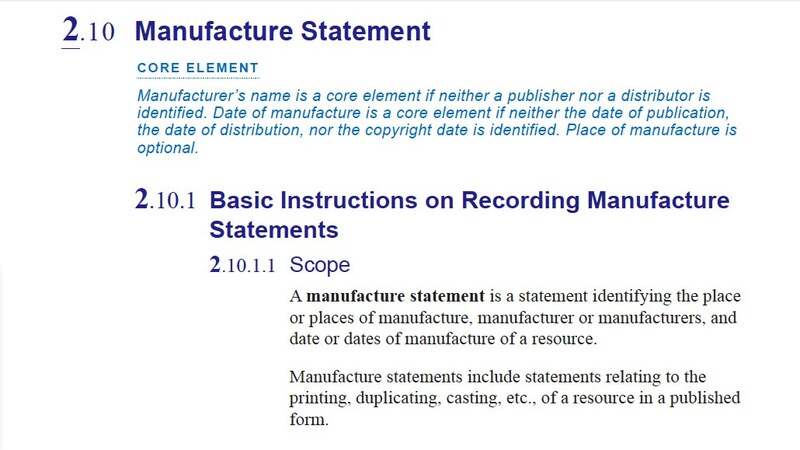 Earlier, I mentioned my doubts whether the printing statement can be considered as a secondary source of information under current AACR2 cataloging rules. 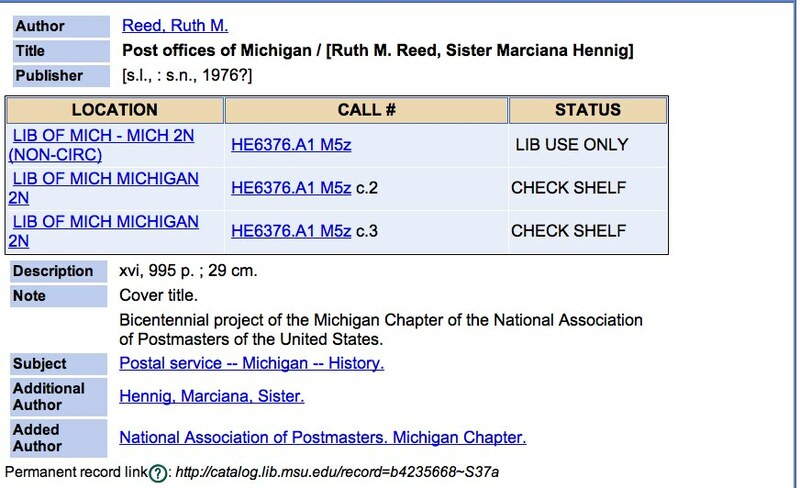 Professional library catalogers reading this blog post should chime in and correct me if I'm wrong; but I don't believe the Printing Statement is considered to be a core element of the catalog record under AACR2. 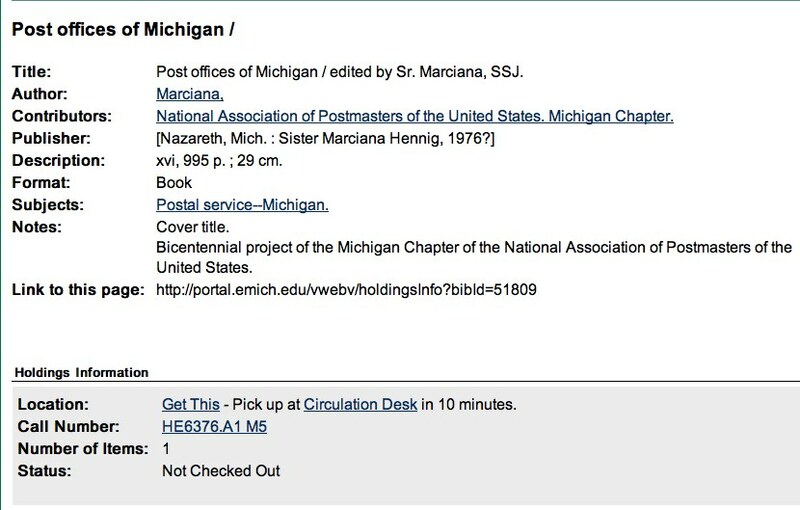 The only thing I would change with the Van Buren catalog record is its title, "Serving You; Post Offices of Michigan." I believe the dates 1802-1976 should be included in the title because the book was a special project for 1976, the bicentennial year. 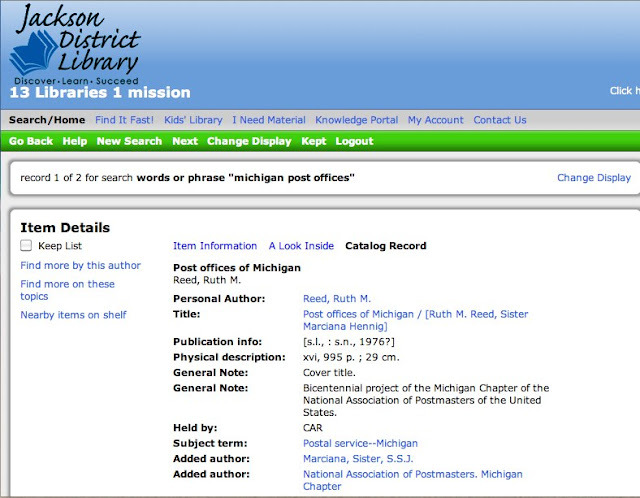 Moreover, it contains the histories of the post offices of Michigan from 1802 to 1976. 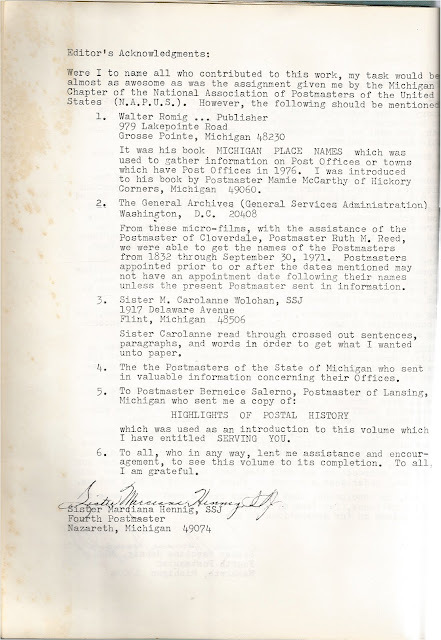 Page 76: Larry Hester was appointed Postmaster, Bellevue,Mi. 49021 on July 3, 1976. 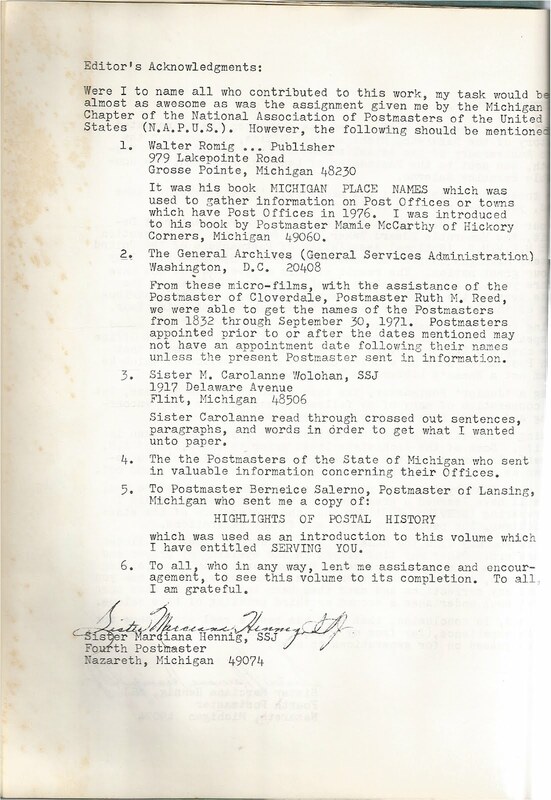 Page 279: Alfred Hewitt was appointed Postmaster, East Tawas, Mi. 48730 on April 23, 1976. Page 284: Edenville, Mi. 49825. "...was housed in a one-hudred year old building until it was moved into a new building on May 1, 1976." Page 289: Elkton, Mi. 48731. "In 1955, in need of larger quarters, it was moved to a location on Highway M-142. and recently (May 29,1976) directly across the street into a new Postal Facility of 1056 square feet." Page 309: Fairview, Mi. 48621. "As of this writing, 1976, Postmaster Carl Krepp has already served the people of Fairview for twenty-five years." Page 522: Lansing, Mi. 48924. "During FY 1976 revenue from postage alone had grown to ...."
Page 537: Limestone, Mi. 49851. "The postoffice [sic], as of 1976, is a fourth class office, serving the people of the area." Page 795: Romeo, Mi. 48065. "Romeo, in 1976, is a first class Post Office." Page 825: Saline, Mi. 48176. "Postmaster Heffington died in office in February 1976." Page 986: Winn, Mi. 48896. 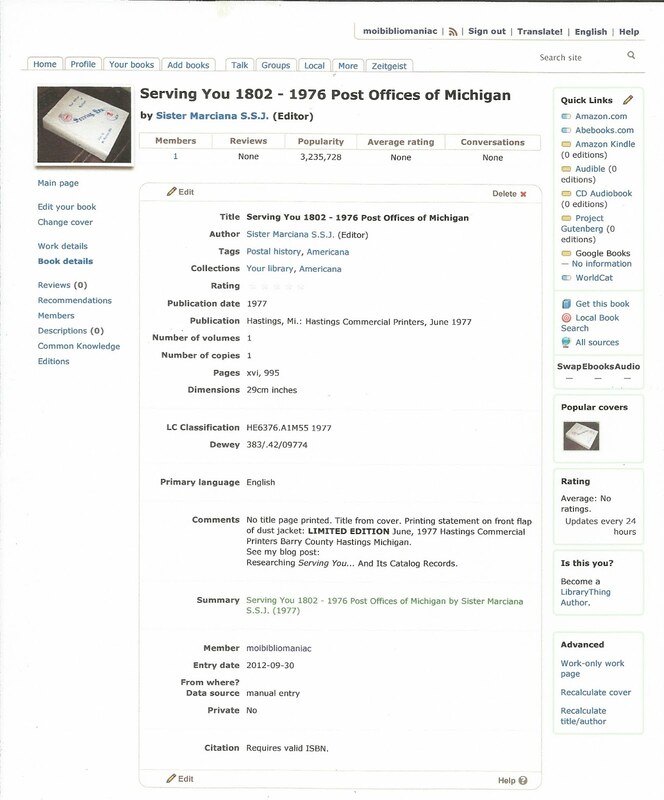 "Aside from the Post Office, 1976 is Winn's centennial year and a great celebration was held from June 17-20.... On August 27, 1976, we are doing the 'Patriotic Songs' at the Isabella County Fair...."
The Postmaster of the Winn, Mi. 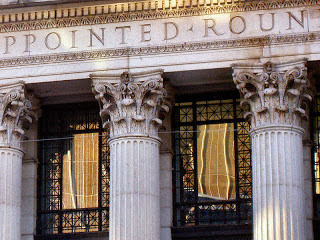 Post Office submitted this last entry no sooner than June 21, 1976 and no later than August 26, 1976. The latest recorded dated entry in the entire book is July 3, 1976. If Sister Marciana's book were published in 1976, this effectively gives her less than six months to complete the compiling and editing of her book, not to mention how much time Hastings Commercial Printers would need to print it. I should also note that there are two copies of this book listed on AbeBooks, but with different titles and different dates of publication. One of them, Post Offices of Michigan; Serving You, 1802 - 1976, is a stated Limited Edition, and has a date of publication of 1977. This copy has the dust jacket. 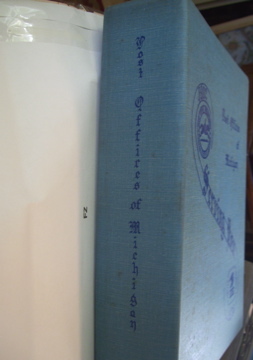 The other copy, Serving You, 1802-1976: Post Offices of Michigan, Dedicated to Our Fellow Postmasters Who Have And Who Are "Serving You," is reportedly a first edition, first printing, and has a date of publication of 1976; however, the listing does not mention that the dust jacket is present. This copy has a presentation inscription from the author. The inscription, however, is dated 1977, which should send up red flares! In bold capital letters in the printing statement, or soon-to-be-called manufacture statement, on the front flap of the dust jacket are the words, LIMITED EDITION, which to me means there was only one edition, and only one printing. If there were 1976 and 1977 printings, I'm sure the 1977 printing would have said, "second printing," instead of "Limited Edition." But to rule out the implausible, I queried Toni I. Benson, Local History Librarian, Van Buren District Library, Decatur, MI, and asked her to verify the date of printing on the dust jacket of her copy. The date on her copy is June 1977 as well. Btw, kudos for the Van Buren District Library's page, vbdl.org. Lots of information. I particularly liked the Election Information. How would you catalog the book?